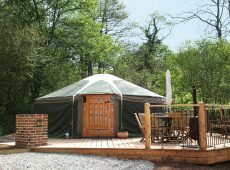 Yurt 1 sleeps 7, has a super king-size bed, its own well equipped kitchen and its own toilet. 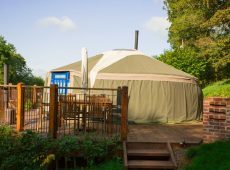 It is the first yurt in the field, is closer to the stream and is located a little away from the other four yurts. 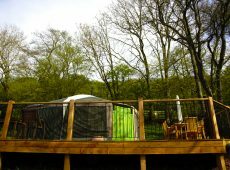 The view from the front door looks down the length of the yurt field, while the view from the back door overlooks the stream. 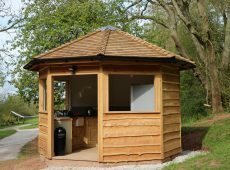 It offers more privacy, closer facilities and is more sheltered by the trees. 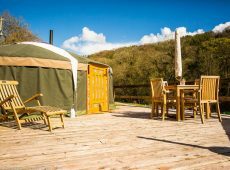 Yurt 1 has a large deck with a table, plenty of seating, a built in stone BBQ, chimenea and a wood store. 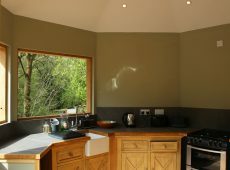 For larger groups the kitchen can always be shared with Yurt 2. 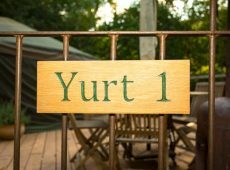 Find out more about Yurt 1. 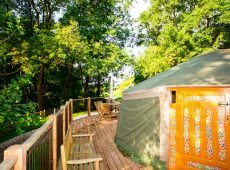 Yurt 2 sleeps 7, has a super king-size bed, and is located in a good peaceful, sunny location not too far from the main facilities but is set back slightly so is a bit more secluded than Yurt 3. 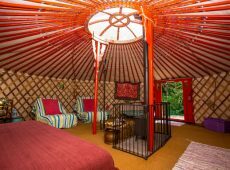 It is between the two other 7-person yurts 1 and 3, so may appeal to those booking for a large group. 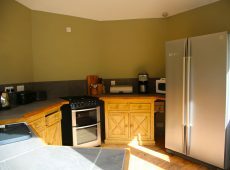 It has its own toilet and if booked with a large group can share the kitchen near Yurt 1. 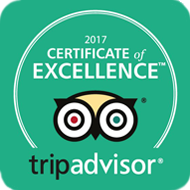 It has trees on one side so offers partial shade also. 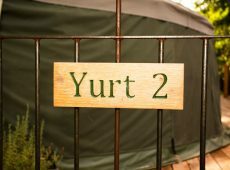 Find out more about Yurt 2. 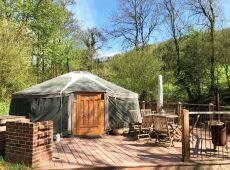 Yurt 3 sleeps 7, has a super king-size bed and is located in a lovely sunny location close to the kitchen and bathrooms and overlooks the camp fire, boules pitch and has views down the valley. 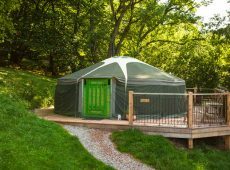 This yurt is perfect if you want to supervise your children and be close to the main facilities. 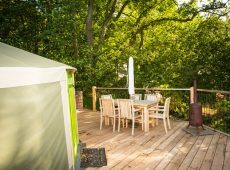 The large deck is also great for those who want to chill out in the sun! 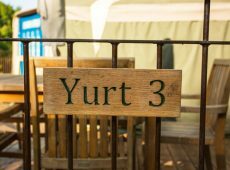 Find out more about Yurt 3. 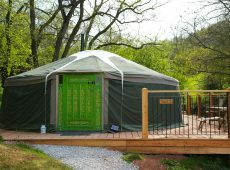 Yurt 4 sleeps 5 and is located on the other side of the communal kitchen and bathrooms. 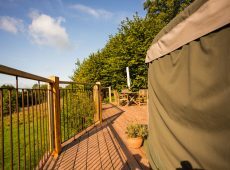 The back door opens onto a large decked area which has fantastic views down the valley. 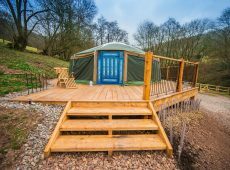 This yurt is perfect for those who want a little privacy but still to be close to the facilities, also for those who want a large eating and sunbathing space of their own. 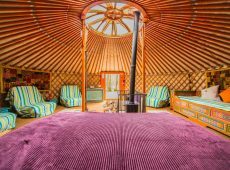 It is close to Yurt 5 (although their deck is on the other side of the yurt offering privacy) so these two yurts would be an ideal choice for two groups of 5 people. 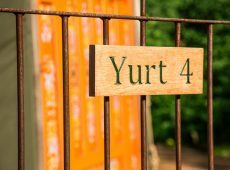 Find out more about Yurt 4. 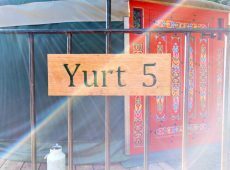 Yurt 5 sleeps 5 and is the last yurt in the field, in a gloriously sunny spot and because it is beyond the other 4 yurts, it’s really quiet and secluded. 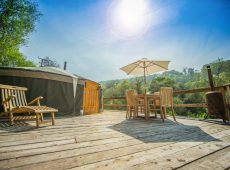 This yurt is perfect for those who want privacy or who want a large eating and sunbathing space of their own. 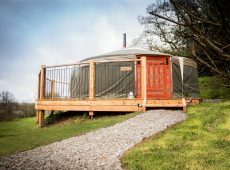 The view from Yurt 5 takes in the length of the field with long views over the Welsh countryside. 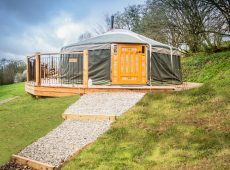 West facing you will get the best views of the sunset from Yurt 5 also. A perfect peaceful location. 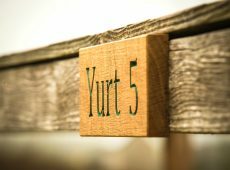 Find out more about Yurt 5.